We’ve been quiet recently, hunkered down into our winter life. (Above: Lettuce growing in our high tunnel this week.) All the beds in the fields are in their dormant stage – we won’t be harvesting anything from the fields until after new plantings this spring. So what’s a farm to do? Receive seed orders! Our most heartfelt appreciation goes out to all the amazing CSA members who have already paid into our farm for the 2015 season. This box of seeds comes with a hefty price tag, and we are able to buy seeds without borrowing money thanks to you! Our big soil amendment and supplies orders come in during the next couple of weeks. Again, the investment of CSA members has made that possible. We are so grateful for your prioritizing our work (and your food!) and for your faith in us as growers of your food. Construction on the barn has continued at a frenetic pace. This week we have gotten our new walk in cooler framed and mostly insulated. We will be improving our wash-and-pack area and soon fully using the barn to wash, pack, and store your veggies. Next we will be putting up walls around the pick-up area of the barn, pretty it up, and have it ready for customers to pick up their vegetables this spring! Winter allows us the time to get out more in the evenings and weekends, as the work days are shorter. 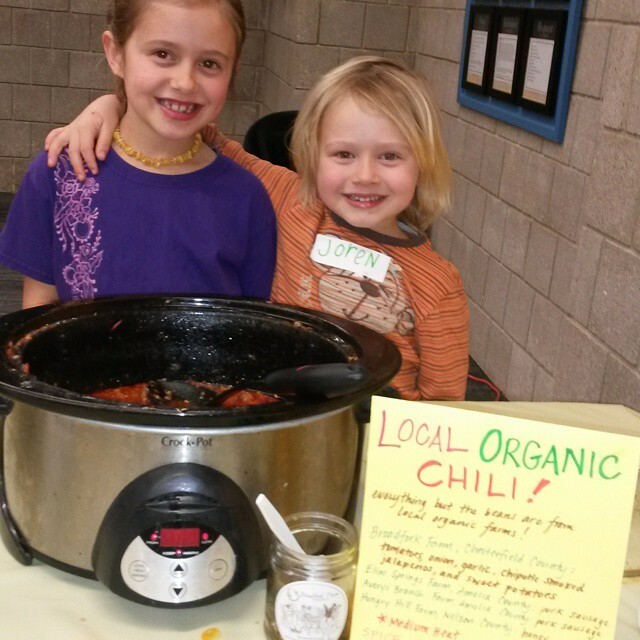 We have been loving our community circles (led by our children’s activities, of course): acoustic music at the library, the children’s museum, swimming in the indoor pool, and a chili cook-off at our First UU Church. Garlic, Sweet Hakurei Turnips, Pepper Jelly, and naturally leavened Hearth Baked Bread. **One change for 2015: CSA Ordering through our website will close at 8:00 am on the day before pick up. Thank you for ordering! **Remember: 2014 Market Share CSA memberships have now ended. If you wish to invest in our farm, order from us in 2015, and have access to our harvest before we start attending the farmers’ markets next year, please Sign up for our 2015 CSA season! Though the main harvest season is still a way off, your investment now allows us the funds to purchase expensive start up supplies for 2015: fertilizers, soil amendments, seed, irrigation supplies, framing and insulation for our new walk-in cooler, etc. **We are now accepting applications for 2015 Internship positions. Please share the details in this link with anyone you think may be interested. 2015 Market Share CSA Members: Choose your selection through our Online Ordering to order for pick up on Wednesday at our farm or at Good Health Herbs. **Anyone may order select goods from us, when available, through Fall Line Farms, Richmond’s online farmers’ market. You can use discount code “broadfork” to earn a complimentary 6 month membership. Our favorite farming conference is approaching! The annual Virginia Biological Farming Conference, Jan 30-31, which includes a session in which Dan is presenting about our grafted tomato trials.Tickets and more info here. We hope you will join us!